New this year to Mickey’s Not-So-Scary Halloween Party in the Magic Kingdom Park is the devilish dessert party that will be taking place in Cinderella’s Castle. Lady Tremaine and her villainous friends have taken over Cinderella’s Castle and are having a delicious dessert party with wickedly fun entertainment and villainous character meet and greets. The event will take place in the great halls of Cinderella’s Royal Table, which has been transformed into an upscale villainous room. 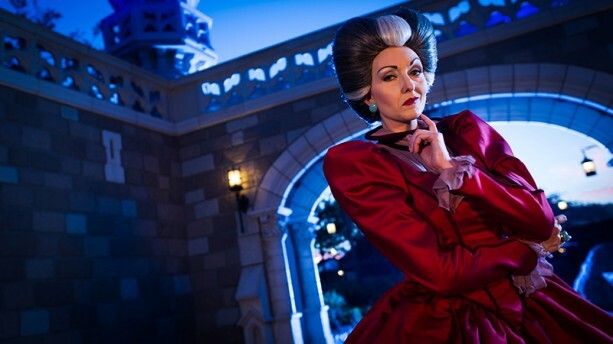 Here guests will enjoy live music, which includes being serenaded with solos from Lady Tremaine herself. You’ll also enjoy an array of delectable desserts and specialty non-alcoholic beverages. Upon leaving the dessert party guests will receive an autograph card and a souvenir Maleficent dragon cup! As an added bonus to the dessert party, guests will have reserved seating for Mickey’s Boo-to-You Halloween Parade and a reserved viewing area for HalloWishes, the nighttime spectacular. For those Disney Villain Character fans there will be several of your favorite villains attending the dessert party. Those attending will be Lady Tremaine, The Queen of Hearts, Captain Hook, Frollo, Maleficent, Cruella, Facillier and the Evil Queen. Most of these characters will not be doing meet and greets during the Halloween Party. This may be your only chance to see them. Admission to the Villains’ Sinister Soiree: A Wicked Takeover of Cinderella Castle is available for $99 per person, plus tax (gratuity included). Guests are required to have already purchased admission to Mickey’s Not-So-Scary Halloween Party. Reservations can only be booked by calling in. To make a reservation, please call (407) 939-5262. Reservation are expected to go quickly, so don’t wait until the event to make a reservation. The Dessert Soiree at Cinderella’s Royal Table, taking place at both 10:15 p.m. and 11:45 p.m. on September 1, 9 and 12, 2014; and at 10:15 p.m. only on September 14, 16, 19, 21, 23, 26, 28 and October 2, 3, 5, 9, 10, 13, 16, 17, 19, 21, 23, 24, 26, 28, 30 and 31, 2014. To check in for the event, you will visit the main will call booth outside the main entrance of the Magic Kingdom park from 4:00 pm to 6:30 pm. Starting at 7:30 pm. you can check-in at the parade and fireworks viewing area in the central plaza by the Castle Forecourt State. It is recommended you check in at will call for saving time and for convenience. Once you have checked in, you’ll receive a wristband, which must be presented to enter the preferred viewing areas and Cinderella’s Royal Table. You can also check in at Cinderella’s Royal Table if you don’t want to participate in the preferred seating extras for both the parade or fireworks. For more information or to buy tickets to Mickey’s Not-So-Scary Halloween party, please contact me at cody@woodbreyfamilytravel.com. I also book and plan trips to Disneyland and to the Disney Cruise Line. Posted on August 25, 2014, in Announcements, Disney Characters, Disney Events, Walt Disney World and tagged Captain Hook, Characters, Cruella, Disney, Disney Atmosphere, Disney Characters, Disney Parks, Dr. Facillier, Evil Queen, Frollo, Halloween, Holiday, Lady Tremaine, Maleficent, Queen of Hearts, Villains, WDW, WDW Holiday. Bookmark the permalink. Leave a comment.